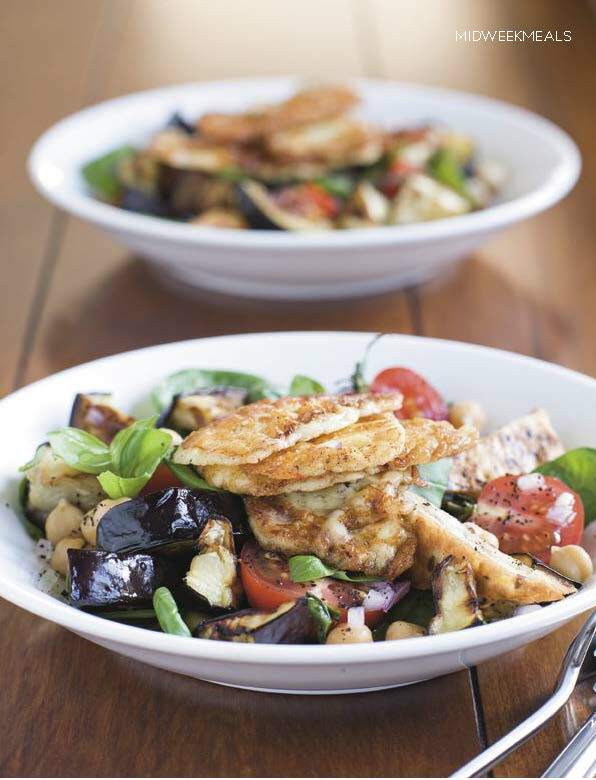 Mediterranean flavours work well in this main course summer salad – I am loving the new Whitestone Haloumi! 1 Cut the eggplant into large rounds. Cut each round in half, then quarters, then ​each quarter in half. Place the wedges on an oven tray. Cut the pita rounds in the same way and add them to the oven tray. Sprinkle about 3 Tbsp olive oil over the eggplant, toss to coat. Fan bake for 10 minutes at 175°C. Remove the pita croutons and continue to bake the eggplant until golden, for about 5 minutes. Remove from the oven and allow to cool. Heat a frying pan and add the remaining oil. Pan-fry the haloumi over a medium heat and cook until golden on both sides. Place cheese on a plate until cool, handling carefully. Scatter the spinach leaves across a shallow platter. Layer the salad ingredients on top, alternating with the baked eggplant and pita croutons. Sprinkle with diced onion and scatter with torn basil leaves. Top with pan-fried haloumi. Sprinkle with the sumac and season to taste. Squeeze fresh lemon juice over the top, drizzle with the extra virgin olive oil and serve.